How Consciousness forms the Reality we perceive. You Create Your Own Reality. The Two Kinds of Order. Einstein once spoke of the physicist David Bohm as his successor. Bohm introduced concepts of Implicate Order and Explicate Order. Bohm defined explicate order as the order of the physical world. He defined implicate order as the source of explicate order, and as an underlying whole that physical form constantly unfolds out from and enfolds back into. “There is no matter as such. All matter originates and exists only by virtue of a force which brings the particle of an atom to vibration and holds this most minute solar system of the atom together. When it comes to creating your own reality you do so on every level of existence whether you are focused into the physical, the astral, the mental or any other reality you care to envisage. You work within the parameters of that reality with the tools available to you in that reality. The connecting thread here is the desires of the consciousness that focuses in each of these different realities. There may be a reason to play with different presentations, different scenarios in an easily manipulated or malleable reality where ideas can be “imagineered” with ease and many potential scenarios examined, their results assessed and those not fitting the desired end are then discarded. If you imagine both different aspects of the consciousness focus in each of the so-called planes creating and testing out their own hypothetical methods, routes, concepts, courses of action and then by cooperation and examination refining down to two or three so that the physical brain or the mind interfacing with the physical brain can present just a limited choice so as not to overwhelm the body consciousness. When speaking here we need to have you remember that words such as body consciousness encompass the brain and the connections with the, what you would call, astral self or mental self or mind. It is difficult to be definitive on this subject as all interpenetrate each other and one cannot put a locus on any particular aspect of contemplation or communication as the level of intensity as regards courses of action, ideas etc. can vary from one plane to another. One may step outside the usual transmission route by considering a thought of such intensity that it merely swamps the voices of other thoughts. Let us discuss what has previously been spoken about from the Seth book and this is the nature of the totality of consciousness that is presently engaged in physical reality. Now, again we have the argument that the physical reality that you think you inhabit is actually an illusion, but even illusions are fabrications of light, you might say, or fabrications of the imagination, whatever it is you actually do see. You do see, you do hear and you do feel, now whether or not they are nebulous in terms of being mostly space it is immaterial, to you they are still a mental creation. Do you understand this? This mental creation, albeit physical creation to you, is mental, they are interchangeable and so, the same applies to all consciousness because your physical reality shows stars and planets and everything else and so it is. Now would you think that the consciousnesses that make up the earth and the consciousnesses that make up the sun do not exist and they are only purely in man’s imagination and everything else is in man’s imagination, of course it isn’t. No. I was going to say that does not sound right. They are all consisting of… as soon as you try to understand that everything is part of the same source, whatever you wish to call it, you can call it waves, you can call it particles, you can call it whatever you wish, consciousness, it does not matter. Whenever you look into what you think your reality is you come down to some kind of homogenous overall totality from which images and tapestries are fabricated using the imagination. So, if you find yourself in the midst of a major event consisting of many thousands of people then how much do you think that you influence what goes on? You would say, “most unlikely”. You would be able to play a part but unless we can get the attention of the whole crowd and have them listen to us and have the appropriate equipment so that they can all listen to us then we cannot influence events very much. Should there not be the continual methods of communication to the mass from the individual then the mass will tend to go its own way. You look at your own society and in general the major portion of time is spent in doing your own thing and a certain amount of time is spent working, via your taxes you may say, in a co-operative manner, however in general you act as an individual. Now, apply this to the sheer mass of consciousness, you accord each wave, particle its own consciousness in a co-operative endeavour, to the sheer bulk of consciousness involved in the stars and the planets etc. and indeed they are living in a reality totally divorced from your own reality, and as was previously said this is pretty much the same as the bacteria living upon your skin in their own communities, living their own lives and with regard to the mites etc. they are procreating and that analogy is easily drawn with that of the earth and yourselves except, of course, through human nature, its ego and its predilection to self-importance way above its station, it feels that it is different… you cannot possibly equate a human being on the earth with a mite on a human being, and yet obviously the parallel is very hard to ignore. So, one must look round and say, yes there are certain elements you have to look at and say, “we have agreed to inhabit this area, to create our own reality within this area” and they are operative words, to create our own reality within this other reality and we have to roll with the punches. We have to see what is going on, sense what is going on, feel what is going on between the big players and find our own way of surviving within that area. If, for example, the sun decided to go into a frenzy of activity and send out far more radiation then we would have to vacate the earth, switch your focus away from the earth, because the structures that we have fabricated to live within the earth’s atmosphere would then not have the atmosphere to live in. So we would have to change and look for something else. If you go back through the “history” of the earth you will see on many occasions you have had to evacuate whole areas of the earth due to various climactic events, ice ages, formation of deserts etc. You can look at your ice ages, you can look at the Sahara desert, shifting sands etc. and you will see that you had to change your ideas. An idea that would work at one point in time does not work at another point in time, because when the Sahara did not exist and it was green and fertile land then you could organise a community there and now you cannot. The same would apply if another ice age starts then certain countries would no longer be inhabitable and you would have to move. When it comes to the human species, the human species is, again, only a focus of certain conglomerates of consciousness and the same applies to every other species including water, minerals and everything else, call them species if you wish. They are merely focusses of consciousness. It is nothing to do with one being better than the other. Some conglomerates of consciousness have chosen to be more active than others and we label this imagination, but that is simply a question of a greater deal of activity of that particular group of consciousness that focus on being human beings. The differences between species are not as great as you believe. One has to remember that every single thing, event, apparent reality is simply a manifestation of consciousness and that manifestation of consciousness is manifested in different degrees of intensity. That intensity may also be interpreted as, in physical plane terms, speed of movement, rapid change of focus. So, see yourself as a player creating your own reality but do not give yourself dominion over much larger and powerful concentrations of consciousness. Obviously we are living many lives all at once and one of those lives is an earth life. Can you give us any idea of what any of the other lives might be like? Anything you wish to imagine can be created. You are already aware of that but you are trying to understand other lives in terms of your own life. Now we can just sit here and say to you “Yes, you can see yourself as a very handsome man, very rich, one of the world’s rulers”…….. I wasn’t thinking in those terms, that’s still thinking in human terms. Exactly. Now switch outside that. So switch yourself, do this by degrees otherwise your imagination will not be able to cope, you will have to switch by degrees, in which you then say, “Now what if I was a creature of the air?” Now, you will immediately think of a bird, but what if you were a creature of the air in that you were a bubble say, a bubble that doesn’t burst and then try to move your consciousness and feel what it would be like to be swept along, swept up, swept down and then move to the next stage where this is no longer in an earth, in a physical situation. So we still feel ourselves as a bubble but that is as an analogy only. So, now you see yourself as a bubble of awareness and so you are looking out through an imaginary bubble and now you see, and you want to create something so you create in your imagination, the same as if you close your eyes and try to imagine a scene and of course you can only imagine scenes that you have experienced in the physical at the moment. But because you can see other people’s imaginings as well, you are looking through your bubble and you are seeing all these happenings going on, all these imaginary pictures appearing and disappearing, appearing and disappearing, and you look into this one and you look into that one. Now, your imagination can run as far as ours, we can say to you that we can find ourselves in realms of wonderful roller coasters of colour, we ride the rainbow, you might say, we are up there, we slide down the rainbow to the accompaniment of glorious music and then we launch from there and we imagine ourselves with wings. We have to put this in terms you can understand, otherwise we have no analogies to draw. So we have to take you by degrees to where you can understand that anything is possible….. this is why these things are so difficult to explain. Let’s change the question then. Can you describe another life that you have lead? A non-physical life that you have lead? Yes, you would have to choose one of the minds….. But then that mind has been engaged with many, many other minds as well and we can give you anything we like in exactly the same way as a reincarnational story. For example we could say we were a dressmaker back in the time of King Henry VIII and describe a life and embellish it somewhat. Yes but I was looking for a non-physical life. We were describing one before when we saying about riding the rainbow. Now if you wanted sheer joy and enjoyment imagine riding a rainbow. Well, you can do that. Take your rainbow away from the earth. Imagine the picture savers on the computer, bursts of colour, you watch all the different things happening as the colours move and swirl. Now imagine yourself being able to move with that colour, being part of the colour, swirling, the emotion. You enjoy dancing, can you imagine being swirled in the colour and just going with the flow and as you are told about heavenly choirs of angels, well this is just music but imagine the pleasure that everybody would be getting from producing music. Think of the number of musicians who suddenly find they are better than they could possibly imagine. Previously they had to use a physical body but now that they can imagine, the music they produce flows straight from their consciousness and imagination. The same with singers. Singers dream of hitting and holding certain notes and purity of tone. They imagine it. Well imagine that just because you think, it is. Put that together and imagine, no time, how long you could enjoy being swept around, but bodiless, weightless with just the wonderful sensations of sound and feelings of rhythmic movement and the sights of the colours, just what pleasure that would be. Now, forget the business of life because you think of life in terms of time. Before you can imagine other dimensions of reality you have to drop off the ideas of beginnings and endings and growth. You must be able to accept the concept of just “beingness”, “isness”, being in the moment. Every moment is a life. Would you say a life is any different if it lasts three days or three hundred years? You still call it a life. So what we have just described would be one of the things that you would use for, you might say, bliss. No decisions just pure enjoyment. What we have described, how blissful would that seem to be? You would be lost in the moment. The colours are wonderful, you don’t know what‘s coming next, all joyful. There are no shocks because the movements are very rhythmic because you have the feeling of movement. As the music moves you and you feel the music when you dance in the physical then there’s no difference to your feeling the music in your, you might say, mind, your consciousness in the non-physical. The same pleasure is experienced and so we are taking you from a concrete physical experience to a bodiless experience yet we have to give you some of the same feelings and emotions otherwise you simply would not be able to understand. How can we describe a feeling to you that you have never experienced? You see! You only have your own senses here but there are other senses. It is impossible to talk about them because there is just no parallel. So it is best for you to think that anything that you could possibly imagine can be experienced. Now we have just used our imagination to describe to you a potential existence and from there you can go to any single thing you wish because anything you think of you can be part of. Now, that will depend if the idea that you think of requires more than just your awareness. When it requires more than just your own awareness then you must cooperate with others to get sufficient intensity to alter the fabric. But that is part of the joy as well because at some time all ideas will be manifested in one fashion or another. We use the word “time” but of course we are talking all the time, so difficult! of infinite potential. Everything is possible. All consciousness has the ability to be completely fulfilled but again you will ask ”why do all these things happen on the earth”? We say back to you once more, why do you produce all these violent things? We don’t mean actually physical, we mean your dramas, your films, your games etc. You do them for enjoyment. However horrible they may seem, how many people get involved in them and watch them again and again? Simply because you know it is illusion. Just take one step removed, it’s done because it can be done, because you know that in the end it is effectively meaningless. You always are searching for meaning, purpose, truth, whereas if you just forgot about meaning, purpose, and truth and concentrated on being, enjoying the creation that surrounds you knowing that there are many other areas and that the imagination is limitless, the potential is limitless, but for the moment you have joined in with the idea of your own particular personality living what you consider to be a life in a physical arena. Yes, I try to do that. Exactly. Some do, some don’t. And so you might say I have agreed because it requires agreement. If the idea envisaged, the life envisaged was to be for a life of say 80 years involving XYZ events then at some stage or another the consciousnesses minds involved have to say “yes we agree to do this. Why then, if you agreed to that in the first place, would you suddenly decide, well I have had enough of this, I’m going? Now if you were in say a team of 11 people and you decided you wanted out and you had all signed contracts to stay in, then how would you leave? Maybe your terms of contract would have been that should you leave you cannot leave unless you get somebody to replace you because otherwise you spoil the whole thing. So most minds, most consciousnesses stay with the game. They stick with what they have agreed to. There are exceptions but there are always many other minds that are quite happy to join in. You must remember there are minds that are actually active intense drivers of a particular experience and there are many, many others who are quite happy just to go along for the ride. They gain the experience without having to get involved in the process of direction. If you keep in mind that as above so below then it is quite easy to see how these things perpetuate. For those who need reassurance from the scientific community they will find this set out in David Bohm’s implicate and explicate orders. Now, let us take an idea that is in the imagination, is not material, and yet one can design it in one’s mind, see it, think about how to construct it, what materials, what colour etc. Would you say that is” implicate”? When it is made it is “explicate” but until it is made it is ephemeral. It is merely a fleeting picture in the mind. Yes? So now take lots of consciousnesses all sending their thoughts and concepts, pictures, details to each other and discussing them. They are working in a different framework from the physical. When they take those ideas and turn them into objects and events in the physical world, and for the purposes of what we are saying at the moment, use their instruments that they have created, physical bodies, they are then operating in what we can term “framework one” (physical reality) where you are operating at a distance, shall we say, even though you get lost in the drama (i.e. you do not realise that you have created the reality in which you are immersed). Framework one is where you are operating your instruments. Framework 2 is where you design your instruments. It is in a world of ideas much as if you were not storing your designs on a computer, you were merely playing with the lines and the colours on the screen, but you didn’t actually keep them, then they would be “implicate”, hidden. Whereas if you stored them you have a bridge between the idea and its execution. You have stored the blueprint, the details and the pattern. Even though it has to have much work and energy added to it before you can have the object of the design. Is that satisfactory? In terms of what this life is what will our next life be like? How many different types of lives are being led in the physical? Myriad. Those lives were all chosen by the participating consciousnesses, were all formed by the participating consciousnesses. As you have heard many times before, as there are many preferred environments in the physical so there are many preferred environments in the non-physical. You create, or are drawn to, environments already created by those of like minds, the plural is correct, to yourself. The answer is, whatever you feel comfortable in being involved in. You can review vast numbers of potential experience locations, shall we say. When you first move over, if you read back once more, you will visit and be shown the environments in which your previous loved ones now inhabit. Of course you will be eager to see that, you will be eager to find out how they live, what they have done, what they know. Because they came from roughly the same environment, perhaps not with so much of the technology which you are used to today, they will have found a suitable environment in which to explore the abilities and limits of their new found status. You will look around and you will decide whether it suits you or whether you will move on to another one. Now just as you go to a ballroom dance, the next generation will go to a discotheque. Just as you would have listened to the radio, three generations forward they will be watching their hand held phone. You are always becoming, and moving from one experience to another. When you would go with your parents to a dance you would have gone to a dance of your era. One which pressed your buttons at the time and then became the type of music that you felt made you feel good. As you know, now you are constantly exposed to types of music that make you feel anything but good. Yet others do feel good and would find your choice somewhat pedestrian and boring. So the field is wide open. You need to understand that you have chosen what you are experiencing. If you look forward you can see that you can choose what you wish to experience next, You can decide to stay where you are, doing exactly the same as you are doing, or you can change completely if you wish or you can just have a little dabble and have a week or two doing something entirely different. Many do. Many decide to go off and do a week or a month’s retreat, which they have never done in their lives or take up some activity which they never thought they would ever do. The same applies. Life is continuous. (Heavy emphasis) It does not stop and start. If you would look back at what we have already transmitted to you in the hours that we have spoken you will observe that we say that you are constantly creating your body. You are creating your body from energetic vibrations. Depending on how you wish to perceive something, you can either perceive it as a solid body without understanding that solid body is merely a tight knit connection of electromagnetic wavelengths which, for you and your senses, is reflecting light which gives it the impression of solidity. Yet, should you have x-rays for eyes, just as you have for your machines, the body disappears to x-rays. Certainly the flesh of the body, the extra density of the bones reflect the X-rays and enable you to see. If you went further up the spectrum you wouldn’t see anything at all, or you may see just the vibrations. If you were used to being able to decode those vibrations, as we said, you would be able to hear sounds, make out colours and make out features because you would be able to take the vibratory presentation and, for your understanding, slow it down until the denser hologram, you might say, takes shape. Is that a satisfactory answer? When we talk about the creation of the holographic reality imagine, if you will, looking up into the sky and as you look and you imagine or you visualise, see, wonderful light plays across the sky. As you see the imagined object or event or happening in your mind’s eye so it appears in light moving across the sky. Think what is involved in order that this be produced. It is merely a projection of your thought which has an attractiveness to other consciousnesses that are of course, the night sky and everything that is around. So if your particular imagined object, happening etc. is of interest to consciousness then consciousness can move and travel and inspect and be a part of, travel within, the thought that has been projected. Now, this to you on the ground looking up presents itself as a radiant image. An image of light in the sky and as you changed your moment focus and then one image replaced another within your mind so would the same image sequence play out across the sky. Now the words ”play out” are correct in that you would generally, to start with, actually use this ability to play with, to see what you could do, what you could build, what scenarios you could put together. Play out a battle between two people in that your images are in the sky and then another person beside you decides that he will have an image as well and both of these images that you have are of warriors with swords and they are fighting each other and so the battle goes on until at last one gains advantage and spears the other one. The one falls to the ground and is out and the other one stands victorious. For a third party, unaware of the activities of the first two, thinking that the warriors were real, this would be a tragedy, “I have witnessed the most awful thing”. But to the two people who had manufactured the scenario and were perfectly aware of what they are doing in their scenario, there would be no tragedy, it would merely have been an enjoyable exercise. How do you feel about that when you decide to think about how consciousness creates holographic reality and the physical instruments that are immersed in the holographic reality see the holographic reality that is being created but imagine it to be real? So take it as your higher selves are creating this reality and they know it isn’t real. From the process that we have just described can you understand how nobody, shall we say, dies, without consent, simply because when you imagine the two warriors it is in the imagination, so whatever happens the opposing parties can always recover, even as the sword comes towards them and goes through them they recover immediately just like the cartoon characters that hit the ground, go deeply into the ground, should be dead but merely climb out and start all over again. The one in the physical can only see the light show i.e. the hologram and you must assume that everything that you are looking at, at the moment is reflecting light because if you turn the light out it isn’t there. It is there as far as you are concerned, you can reach out and touch because that pattern is there, the force is there, but you need light to be bounced off it in order for it to be observable. So take this as all these objects are created by your higher self but you can only apprehend them through the senses that your instrument has been endowed with. You are unaware that the whole scenario is effectively a mirage. Once upon a time a thought arose. Consciousnesses were interested in that thought and they decided “I’ll focus upon this thought” and others joined in and gradually the intensity built up and the thought, starting from a skeleton of a thought, gradually, you might say, fleshed out, both in terms of the physical instrument and the story line of that instrument, from what you would call birth, to what you would call death, even though that is being created in every instant. You are being born and dying in every instant, in the same way that electricity in AC is going backwards and forwards, you are being re-created in every moment. In the same way electrons are going in and out of existence. When it comes to what you are choosing, you are merely, we are coming back to the “you” again you see… there is no “you”…there is merely what is seen. If we come back to a unit of consciousness, a unit of consciousness can experience a “you” in a certain fashion. But the “you” only arises when a certain intensity of, say, emotion, a certain intensity of feeling is attained with multitudinous units of consciousness. That intensity of feeling results in a manifestation and that manifestation means an action. An action, an opinion, a belief, it is all one and the same thing really. It is just a question of that in “time” you will see things in a linear framework but all actually happens at the same time. So it is not a question so much of choice, it is a question of interest. A question of interest, a question of focus, a question of intensity. So the choice, if you wish, made by a unit of consciousness is merely “well, this looks interesting”, but do enough units join that consciousness in order for it to manifest? You might ask the question, “Why do some children not get born? Simply because not enough intensity can be generated to carry the process through. This may be because the construction is not going as well as planned or the intensity regarding the story line has changed, many reasons. It is all to do with how the conglomerate of consciousness, the gestalt of consciousness reaches the intensity for manifestation. If it does not reach the intensity for manifestation then it will not manifest. How do you form any endeavour? You have had this transmitted to you and spoken about ad nauseam by David. When you have the idea of a life you then set about to see how you can create that life and all the necessary things you need in order for that life to eventuate. And so in order for the pattern to be constructed you have to choose the materials from which that pattern can be constructed and insert the event of conception into the time framework that you can see is likely to ……difficult once more because all is there…….so to make it easier to explain….. you take your reel of film of what is going on and, this isn’t correct of course, you insert yourself into a certain reel of film so that the film will then have you in it and will then change the outcome as it goes along. But you must remember that there is more than one film all the time, so you can pick up a film at any time, insert yourself into the frame and effectively then produce new frames as the film goes along . This is extremely difficult to explain in terms of what you are seeing as a linear, physical manifestation. Turn this around and see this as your own consciousness imagining a life and deciding, this is me in my mother’s womb and being able to tune into the pattern sequence that conception to birth takes. Building that pattern around yourself so you can experience it. Of course you are doing this with many other consciousnesses simultaneously. You are entering in to the play that you and your fellows are constantly creating as you go along. Then you get what you would call your illusion of reality. Illusion just means like trance, various amounts of depth, various amounts of solidity depending on the level at which you wish to participate in. If you focus intently with your fellows on creating a straw house you will inhabit a straw house. On the other hand if you focus intently on creating a 100 storey block of condominiums in which you have the penthouse then that is what you will have. You create all your experiences. It is impossible to draw an analogy using the methodology you use in the physical plane to describe what happens in the mental plane. It is like you wave a wand and it is there. That is much nearer the truth than you think. Life is magic, as you know it. Do you believe that each individual conscious awareness is capable of creating its own reality? I think that reality is created by lots of consciousnesses getting together so it is a joint creation. That is ok, but you have to agree to get together because you can always retreat into your shell, shall we say, and just be aware of the shell around you. So perhaps you can explain what happens to those who do retreat into their shell and do not agree to what would be their reality. As we said a few moments ago you open your shell, figuratively speaking, each morning and decide, from the infinite array of possibilities, what you wish to focus upon. Now, from, we must say, your limited point of view, it is quite easy when creating your own system of beliefs to actually believe in your own creation. To actually believe that you have no power to change your reality. But once you sit down and think very carefully about this then you do have some power to create your own reality. It may not end in the outcome that you envisage especially if that outcome is too far divorced from the position you have already created within that reality. You cannot have a sudden transformation from being a refugee to living in a million dollar apartment in another part of the world but as your refugees have shown those who sincerely wish to change their reality can take steps to change their reality. You have chosen to come into a physical system, you cannot change your reality just as you can change your imagination for you have already stepped into a system that, shall we say, takes time and much energy to create the objects, the events, that exist within that system. Should you retreat into your mind, then in your imaginations you can create whatever you wish to experience. However, you will not experience them in the same way as you do in the physical. Imagine yourself on your golf course, now you can see yourself swinging the club, hitting the ball, it bouncing on the green and in your mind you can see the pin and the ball bouncing towards the pin and settling a few inches away. You can actually experience the emotion of watching that shot fly through the air and you will feel yourself happy and satisfied. That will have the corresponding effect on your chemical processes within your body and this form of daydreaming can be very pleasurable, but then you realise that you are in the physical reality operating a physical body and then you wish to do the same thing. And it, in most circumstances, does not come out to the same conclusion as in your visualisation. That is all about the process of learning to create your own reality and so as you repeat this endeavour many thousands of times you actually, together with your physical body which are one and the same of course, get better and better in the process of creation until you get so good that you feel, I think, this is as far as I need to go with this, and you look for something else which you can take on the challenge for. Now, you must, whenever you look at any reality realise that all participating in that reality have chosen their position within that reality because they cannot be annihilated. That is impossible. Therefore should they wish to turn their focus to another reality they simply withdraw their consciousness from the instrument. Of course the instrument like everything else has been co-created and therefore as consciousnesses accumulate and disperse around a particular pattern then it takes a majority of different intensities to decide on whether the event continues to be experienced or is simply terminated. Does that make anything clearer for you? Thank you. So would you say that our world is a reflection of one expressed on a third dimensional plane. You have discussed this amongst yourselves many, many times. Everything that you produce using your minds and your hands and machinery starts with a thought, an idea or intention and let me ask you where do think that thought, that idea or that intention has its home? Could you possibly capture that thought and put it in a box or put it on your computer screen without typing it in say? How could you transfer that from your mind to something outside yourself except through a process of manipulating energy until you have a dense object? Well, we don’t know how to yet. Not in this..
Not in this reality but in another reality. You have some indication of this when you are able to influence certain physical objects such as staring at another person and them turning round. Something has moved between you and the other person. Yes? The same with telepathy, the idea has gone from one to another. Now what has been received? But you both think of the same idea, so was the idea tangible? Did the thoughts come from somewhere else or did we just pick them up? Where do you think thoughts arise? Well, if we are all in agreement as to how everything is going to go then thoughts must arise in another dimension. Of course. But each consciousness has the ability to think thought and once that thought is released it is able to be picked up. Any other consciousness can become aware of that thought simply because of resonance. Each thought has a certain resonance, has a certain natural state of being and anybody searching, as you would on a radio tuner, will pick that thought up if it is closely allied to something that he has been considering himself. Whether or not he retains that thought and stores it away or merely observes it and lets it pass by, shall we say, is dependent on whether he finds it useful. We are told that there are different levels and temples of knowledge in the afterlife can you expand on either of those please? Merely man’s attempt at trying to explain the infinity of knowledge that exists. The language of the time in which those words were formulated was when the word temple to you would evoke scenes of ancient Egypt and other such eras. Now, who were the people that the populace turned to for wisdom? The priests, the religious emissaries, the agents of the god that everybody thought held dominion over their lives and everything connected with their lives. Now knowledge, beliefs and technology have moved on to where you now, whenever you wish to know something, immediately turn to your computer or other instrument that is connected to the inter…net. Again, the word, even though recently coined, inter…net has its own magic shall we say. We go back to something, from way back when, in the Vedas called Indra’s net, how similar. Now, Indra’s net was imagined to be this enormous net studded with diamonds which were all individual units of consciousness and of course, in that net which was sparkling with connectivity, everything was connected and therefore all thoughts were known, all knowledge was known. Now you have “internet” which; when you look at it carefully, says that everything is interconnected. Yes? You can think your own way through this. All enquirers are looking for something deep and profound and yet when you look into, as the scientists do, the basis of everything, what do you find but a total homogeneity and simplicity of, so far as you have got at the moment, vibrations, vibrating strings or small particles, whichever level you decided to adopt? Tiny little things where when they come together form different patterns and therefore form the universe as you know it. Isn’t that simple? Now taking complexity, and reducing it to simplicity, and yet, when it comes to trying to understand what is going on, and why, we refuse to accept the simple. And the simple is, that you do it. Everything is created simply because you wish to create it, and that includes all your attitudes and beliefs, as well as those things that you consider to be objects. We are confusing the chicken with the egg, so, let us say that the tiny, tiny consciousness, as you put it, can think, it is aware, therefore I must be thinking and so therefore I am. Now, we are all in this together, so I am thinking and I am aware, what am I aware of, so I am aware that I have imagination I can actually think things up and somewhere I remember, there is a memory of something what is it? Ah yes xyz memories, upon memories, upon memories. The tiny consciousnesses are in the same position in regard to their thoughts and of course, because of the interconnection they are not sure, ah, is it my thought? Or is it another thought from somewhere else, but one thought, one memory you might say, of my experience just triggers little bit more thought and suddenly the thought starts to blossom, shall we say, and you start to see, envisage, imagine the blossom and it grows as more are attracted because the same thing is happening to them, as they look their attention is taken and energy is added the more the energy is added the more it grows, the more the imagination. Now can you see how the event grows from this, can you see how from the first hut that was built exactly where you are now then others came and joined it, another hut was built and more then somebody said, “we really ought to have a road to service this hut”, another said, “don’t you think we ought to have a shop so that we don’t have to go too far”. As you carry on with that imaginary exercise for yourself you will soon see how consciousness from the one little unit doing something, having an idea or an action, from little acorns oak trees grow. Blueprints, patterns, we have covered this ground before. It all stems from the desire to create. The desire to create results in thought, results in an idea, if this idea gains approval from many others then the motivation arises to create a reality from the idea. This can happen in many forms of which physical reality is one. So, because you are only aware of physical reality, the term blueprint or pattern is used because you are aware of how objects and events are manufactured from a pre-created plan. What you are not aware of is your imagination instantly appearing in front of you. You have some who have some understanding of this from your quantum science in which it was… began to be understood, the observer, let us say, solidified what he observed. He could not see the electron and its movement at the same time, but if he could decide where it was… I think we are exceeding the knowledge of the instrument here and the correct scientific terminology is not available. Suffice it to say that collapsing the quantum wave, as you, your scientists have stated, results in the formation of a pseudo reality you could say. Now, if you took the attitude that the observer effect when you, we have been through, spoken of this before… that you are able to look at a blank screen which is active and then your imagination lights up various pixels on that screen and whatever picture you think of then appears on the screen. Now this is very much the same as what actually happens, the waves come through, they impinge upon the screen and the screen lights up to varying degrees which gives you the picture. Now that has been taken from a picture existing elsewhere broken down into television waves, just electro-magnetic waves, and then the picture recreated somewhere else using…(a television set) Now just put…give your…oh dear…your consciousness, or mind and let us move forward say, you know your rate of technological progress, so let us move forward say another 500 years, do you think it would be possible just to look at something then it happens? Now you already have voice recognition, where you can make a statement, and the lights switch on, or the curtains draw. Because it recognises the wave, the sound wave. You have now or are on the verge of using thought waves to fire missiles. So it is not without the bounds of conjecture to envisage that you will be able to look at a screen and the picture that you wish to see will appear. Computer aided design comes to mind. How long before the cameras around a screen can track your eye movements and then as you look at the screen you can draw lines around simply by the movement of your eyes. (or change channels, volume etc.) You can see that this could easily be a possibility. Now you think in general terms of speed of motion in a linear fashion. Now start to think of speed of motion in a circular fashion or a spiralling fashion as in an hourglass with the speed of motion rushing in a figure of eight say or spiralling up to the nexus of an hourglass narrowing down, getting dense then spiralling out and getting less dense again and then repeating the pattern. You would say that there is an enormous amount of energy getting to unimaginable speeds but actually getting nowhere. If you imagine all this fantastic amount of energy movement, information transfer, image creation, reality creation, all happening because of moving light. Moving light creating pictures, sensations, meaning sensory perceptions not just tactile or taste , but sensory perceptions meaning the formation of beliefs, the resulting motions etc. All this tremendous speed happening in the same space. Can you understand this? Simply because energy is moving around, we have to give you some idea of space for you to be able to envisage it, so we have said, an hourglass. Imagine this hourglass, we will persist with the same analogy, being reasonably large in front of you, the size of your television screen say, and you see all this enormous activity of energy and colour resulting in pictures in front of you, much as your television. Now imagine yourself surrounded with all this frenetic, unimaginable hive of energetic activity. So as you look around, what was on the television screen is now all around you, and in such a format that all your senses decode this light movement into your realities. Again, easily explained in that sight is light waves, sound is sound waves moving, touch is a tactile sense, an electromagnetic sense, this is for simplicity’s sake, and so on. Now we have got to the point where you have imagined yourself surrounded by a complete ocean of wave activity moving at however many times the speed of light you wish to imagine and this is what you and everybody else, exist in. Now you just have to apply your ideas of scale to this and what you feel that your consciousness is. You already know that photons communicate with each other and yet what do you need to see a photon? What do you need to imagine the size of a quark? At what stage do you say “we need a certain measurement’? You also have to realise that once you leave the physical there is no need for measurement. And so the mystery still remains a mystery because you are not able to use your logical, rational brain which thinks in terms of the parameters of the reality in which you exist to understand the reality of something you have absolutely no conception of. But you can get the general idea .It is not too big a leap of the imagination to have some understanding that the world that surrounds you is indeed, a constantly changing illusion. It is best to find another word for “illusion’. It is indeed, a constantly changing reality. It is just, that for someone who is not endowed with your sense perception organs, there is nothing there! Except said sea of frenetic wave activity. Full of sound and fury signifying nothing, but signifying everything for you. Comment: The air around us is full of sound and vision via radio and television waves but we are completely unaware of any of it unless we use the correct instruments to transform said waves into sight and sound we can comprehend. Likewise for them, if they adopt a different set of sensory perceptions and a different set of rules with their co- creators, their co-participants, then they will see a totally different reality from the same sea of moving energy, because they will decode the waves in a different format. These will not … when you use a set of sensory perceptions you pick out from the sea of moving waves those waves, which of those frequencies, that you wish to form your particular pattern. Yes? Others pick out different waves. You could see this as when we, you have had referred to you God’s tapestry, now imagine this tapestry to be comprised of the most unimaginably small threads and therefore the number of threads would be basically to your concept, infinite, you can’t even count the number of threads. But, you could decide to focus on just one colour of thread. Yes? Remember the threads, in the way they are composed are running through each weft and weave. You focus using a red filter, you will see a picture that the red filter produces and so on. Now, that presupposes of course, a pre-existing picture but now say to yourself I can decide which filaments in which part of the tapestry are which colours and therefore, that particular picture will arise and yet beside you, unbeknownst to you and unbeknownst to them, is another intelligence deciding that the threads in any particular part of the tapestry are going to be seen in a different colour. He will see a totally different reality to you. Neither of you will be aware of the other. This is capable of conception. But is very, very difficult to say the least, to put this into scientific terminology, and thereby underlay the concept, the physical rationality, because simply we are talking about something that has to be experienced to be known of. Now we referred before to imagine yourself surrounded by a television screen which effectively formed the reality in which you are immersed. And we also referred to the computer with the sensors surrounding the screen which tracked your eye movement and then you were able to, simply by moving your eyes, see the design, the lines, as your eyes moved, the lines, the shape appeared on the screen. Now imagine your screen surrounded by thought sensors, they actually pick up your thoughts. So as you think of a tree the tree appears and when you look into the tree you see the shapes of the leaves and you look along a branch and you see a white cockatoo sitting on the branch and you notice his yellow comb. Now can you see that your focus is narrowing down from the general to the particular and as you focus on the particular you lose sight of the general? But then you switch your focus back to the general, that is, the tree and you see the tree once more. You look down, you see a rabbit on the grass below the tree. You notice it is a black rabbit, unusual. Then you look back in the tree and once more you see the cockatoo, because you know it is there. You look back again you see the rabbit, it appears. Now we said, appears, but you knew it was there and the thought sensors picked up the fact that you intended to see the black rabbit and so it appeared. Once more you think of the white cockatoo, you move your gaze, to the other part of the tree and low and behold it is there. Where ever you focus what you believe you are going to see will be there. You are creating your own reality. Sit still and think this process through it will give you a much greater intimation of the process by which you not only create your reality but you gain your sense of self. You can also relate this to the imagination exercise where you had to imagine the body or see the body as simply a mass of moving energy waves and the mind being just also moving energy waves and the two merging. We explained how to visualise yourself being immersed in energy waves all around you so that wherever you looked you saw the energy waves. Take what we have just explained as your point of focus so that everywhere you focus on this sea of energy then the object [you wish to see] appears. Just as you know you will see a rabbit as you look at the ground the rabbit will be there. You will automatically create it. You look back up in the tree and you automatically create the cockatoo that you expect to find. For a humorous exercise we will refer to a famous and mystifying quote by Donald Rumsfeld in which he described what he termed to be “the known knowns”. The “known knowns” you can take as your point of focus that you are actually looking at, you know it is there and you know that you know that it is there. Then there are the “unknown knowns”. This would be comparable to looking at the cockatoo and yet” know” that the rabbit is on the floor, OK, basically you are focusing on the cockatoo which is a “known known” but you also know but the word “unknown”……you must use your faculties here…..you cannot see it at the moment but you know it is there. Then you have the “known unknowns”. Whereby you could look at the scientists, cosmologists looking into the universe and realising that there must be something there. They know there is something there but they cannot pin it down and you can call this a “known unknown”. They do not understand what it is, they can’t see it, but they know it is there. [Potential] Lastly you have the “unknown unknowns” where we will refer you back to another quote “you can only be aware of what you are aware of”, so you cannot be aware of what you are not aware of. Now apply this to your various lives and your points of focus and you will see that wherever you focus you create your reality, you create that self, you know who you are, but when you switch your focus somewhere else you create another reality in which reality you then know who you are. Comment: When you are focused in one reality you think that that is the only reality and that you are the only you. When you switch your focus the same applies. In both cases you have “unknown unknowns”. This is a clever way of showing us that we are totally unaware that we are leading multiple lives in multiple realities. Question re study centres and different types of music. You create your own reality, together. If you are able to join with those of like mind and because there is recognition of, let us say, equality amongst souls or amongst consciousnesses so you are not excluded in terms of class, accent, wealth etc. you are included because you are a fellow traveller. Your thoughts are seen and if you have a genuine desire to join with others in constructing wonderful buildings or beautiful music or scenic gardens then people join together with that goal in mind. They work together and take joy in the finished result. Now when you say, study centres, that is any area of study. While you have been in the physical, how many areas could you look at now and say “If I had the time I would like to get involved in the study of this or that”. In the study of flowers, in the study of animals, in the study of rocks, in the study of the cosmos, we can go on and on and on. So what has been said to be a study centre……..In order to have the feeling or even to give the concept to those who venture from the physical into the non-physical, in the dream or even the near death state say, what would be a physical analogue that would denote the activity. If you just saw a host of sparkling lights then how would you decipher a particular activity going on? But once you see a building with desks or stages or music halls then you instantly comprehend the activity that is being engaged in. So likewise, those who have not been long from the physical and even some of those who have, they would feel that great music requires a great amphitheatre because that is where the enjoyment comes from. Much as any great event is enjoyed so much more when you are present rather than when you are watching it on television. The whole feeling you are swept up within because it is the joy of experiencing en masse rather than individually. So, just as you create buildings here buildings can be created in other dimensions. They are unnecessary but so they are unnecessary here. You do not have to have vast amphitheatres that are full of columns and fancy architecture. You could have a plain and simple barn and provided the acoustics were organised correctly there would be the same enjoyment of the music but would it feel the same without the grandeur of the colour and the light and the tiered seating etc. A sense of occasion adds to the experience so if you feel you wish to create music why not create the space to put the music in. Something different now. We are told that the sun is rotating on its axis, perhaps you would like to talk about that. The physical system is an idea, an idea which is fleshed out by the process of perspective which gives rise to illusion of creation. When a painter or painters have an idea it is generally a, what you would call, concept to start with, and then in order to make the concept a reality the detail must be thought through. As you think the detail through, then you find certain aspects have to be, or rather certain attributes have to be given to different aspects of the concept. So, if you decide that you are going to create a universe then you say, “How do we do this?” Let’s come back to the Big Bang, then you take this, this is an example, as being a truism and there is a vast explosion and creation of hot gases, which then as they cool condense, as water condenses to ice, then the gases condense to minerals. As you have created space and as your experiments have shown that say something dropped in space tends to form a circular ball, then that would give you the answer as to why planets, stars have the appearance of a ball. But that could be expectation, based on a belief that is the only way it can happen. Now, then you look at our own physics and motion and attraction and repulsion and you find that in order for this sort of equilibrium to be established then the various bodies work like a gyroscope, can hold that position if they spin. Once they stop spinning they fall over. Now, you must realise that just as you construct in the physical, then ideas are constructed, and therefore all the attributes are constructed and you are also constructing an environment in which the inhabitants, the constricted consciousnesses, have reason, and therefore, you must be careful to make sure the environment, as perceived, is based in such a way that reason can find satisfactory theories to fit what it perceives. Are you following me? Back to the play. You cannot construct the set of a play that is meant to be in a setting of an oasis in the desert and yet have a sailing ship in the background. Because one of the participants in the play will say, “there is something wrong with this! This is supposed to be desert, what is that doing there?” Can you see? It would be an anachronism, therefore you must ensure that all parts of the jigsaw fit harmoniously together and what is expected to fit does. So, once you have it all spinning, it may not be understandable, but there again if you want to have the uncertainty and the excitement of discovery and knowledge and illusion and progression, then, because in order to utilise the set, consciousness would have to agree, illusions have to be maintained. Therefore, you do not construct an illusion that crumbles at the slightest element of doubt. Do you see? You must construct a believable reality And, as the perceived progression of knowledge progresses, you have to continually change your fine tuning of the perceived reality. So, at one stage, when the earth was flat, the sun was perceived to go round the earth but now, the earth is round and the earth is perceived to go round the sun. Do you see? And yet, we now say, “ah, it wasn’t like that, this is what it is really like. But was it? Or was it changed to suit the change in perception, you will never know. We merely extrapolate our beliefs backwards in time to suit our beliefs in the present, hence, the Big Bang, or the belief in the Big Bang. Can you say something about greater powers, those that have the grand ideas? As in the physical world there are always those that dream of greater things, of the organisation of affairs that work smoothly and connectedly and harmoniously. In much the same way there are those who disagree because they are not being heard and they rebel and in many cases actively endeavour to disrupt the organisation that the majority accept. So greater powers, or rather more properly, those of greater influence, those of greater persuasion, those of greater leadership because as above so below and in reverse most are happier to be followers rather than leaders. So there are those who think and plan, design and create both for those who do not have sufficient desire to go through the intricate process of creation and would rather wish to be given the opportunity to manipulate a pre-prepared vehicle/ instrument. The vehicle may not be exactly to the complete satisfaction of those who decide to take up, you might say, the base model although they would have preferred to have a model with many more features although those features were not being offered by the creators of that model. So, the acceptors try to manipulate the instrument to achieve the desired intentions, even though in many cases the instrument simply does not have the capability, resulting from its design. It does not have those features that are capable of achieving those objectives without a degree of modification. It is like a car, cars are designed with certain shapes and certain engines, interiors and colours. The car can generally be altered to some degree by the addition of certain components, alteration of the colour, you might say expression of personality, various modifications to bring the instrument more into line with the object as desired. So the greater powers as such are the same, as you create your world so worlds are created. As you design cars so worlds are designed. As different cars have different attributes so worlds, realities have different attributes. Cars are now relatively simple mechanisms, they have evolved by the process of perfection of design because there were those who were interested in perfecting that design and yet many drivers not offered a different design will still be happy with any vehicle that simply got them from A to B because that was all the purpose they needed it for. Similarly in your technology you have those who are happy with the simple phone but others who must have a virtual companion in their phone. The ability to be in instant communication at all times with all people with access to all information. Of course there have to be minds that design such instruments and so it is with other realities. There are simple realities, there are complex realities. There are peaceful realities, there are frenetic realities. Fast moving, exciting, fast changing, suited to those groupings that enjoy the challenge, the excitement, the thrill of rapid manipulation and creativity. Those groups, those minds would not be happy in a reality that is peaceful, harmonious and what you might say is some people’s idea of heaven. To others it would be hell. So one entity’s heaven is another’s hell. You choose your heaven, some might say, you choose your hell, depending on your point of view. Now let us repeat from our last conversation and go back to your impression of the source. Its exploration of its creativity, does it make sense? That it would create all its creations equal? You are quite happy with the diversity of species around you and their obvious inequalities but you seem to wish that those you call humans are all created equal. Does not this fly in the face of your logic? So there will be great minds and lesser minds, great intelligences and lesser intelligences. Now that doesn’t mean to say you shouldn’t treat them all equally while still recognising that in terms of creative ability they are not equal. Of course you do recognise that. You do not give the job of extremely high responsibility e.g. of teaching or controlling, let us say, a surgeon who has a life poised underneath his scalpel and the attendant anaesthetist. You do not entrust those positions to those of no training and no knowledge. The training and the knowledge is simply there to weed out those who are not capable. Would you agree? So you have to select those that wish to be and change their instrument and follow a line of development and improvement, to be accepted to perform those responsibilities, which are available only to those who show the determination and the ability and the resourcefulness and the dedication and the responsibility to carry out such as a heart operation or other forms …..So greater powers are relatively easily explained, just as you have great designers of highly technical and highly intricate and extremely delicate machines and may we say, education and other sensitive areas then the same goes at all levels once more. As you see round you, so you will see as you survey other worlds that you may wish to focus into. Does that answer or give you, again, a logical and rational answer? Everything that you will ever know you will find that eventually your own intelligence is capable of understanding. The intelligence that you are is the intelligence that you always will be. You are merely in your present focus being hypnotised by the beliefs and the conditioning that you have accumulated while you have been one pointedly focused into the physical. When you relieve yourself of that focus, you will understand more, we were going to say, of who you are, but what you represent would be better. If you are talking about intelligence you are presumably talking about the intelligence behind the physical body, not the intelligence of the physical body, because the physical could be dyslexic or Down ’s syndrome or whatever. So when you are talking about intelligence you must be talking about the intelligence behind this particular physical body. Intelligence, if we use the word to describe the confluence of thought of all the consciousnesses that wish to experience the physical through the instrument, remains the same. The instrument was designed for the purpose of certain experiences, whether, if you wish, by design or by faulty design. I don’t think you have faulty design. I think you can have design for a purpose, which to some would appear to be a fault but it is not a fault, it is meant to be the design. Unless you are saying that something goes wrong during the design phase. You adopt any belief that you wish. All beliefs are possible as all else is possible, we are merely giving you an option of many. But, the intelligence behind, above, within is still the same. Sorry, that is what I wanted to make clear. I was trying to get you to say that it was that intelligence and not the intelligence in the physical. You are differentiating between the physical intelligence and the non-physical intelligence? There is no difference. There is only the one intelligence, it is how it is expressed. Expressed through the instrument. The instrument is an instrument, it has…. It is difficult to …. Because all is conscious but as we have been endeavouring to describe there are different collections, different gestalts, organisations, aggregations, conglomerations of consciousness with their own purposes to experience. The physical instrument is such a grouping, it does not have a guiding intelligence of its own. You will see this in a new born baby, who teaches the new born baby? Who teaches? Who teaches the baby to cry? Who teaches the baby to close its fingers, to move its head, to sit up? Which intelligence persuades the baby to accept some instructions and some knowledge and reject others. Which intelligence makes choices, the environment provides the options and the intelligence makes choices between the options. The intelligence is with the baby. The baby is the instrument, the consciousnesses are non-physical. The thoughts that come together then activate the instrument to make the choice. So if the instrument is incapable of making the choice then it’s just a design fault with the instrument. If the design fault is with the instrument it could be that the consciousnesses that have focused upon this instrument wanted that experience, could also be that sufficient level of intensity of agreement does not arise for that instrument to behave in the generally accepted form of normality. There are many possible reasons, you simply decide for yourself if you wish to have one or many reasons or beliefs as to why a certain instrument behaves as it does. There is never one answer. In any particular event there are always multiple possibilities. We were sitting under a tree today and I asked you to look up and tell me what it meant to you. If you looked at each one of those waving arms at the end of the branch it was composed of small seeds attached to each frond. Each seed saw itself as an individual, each frond saw itself as an individual, the branch with all the fronds upon it saw itself as an individual. It was attached to a bigger branch, individual, attached to the trunk and when you looked around and stood further away you just saw the tree and the tree saw itself as an individual because it saw other trees as individual and each composed of more individuals, of many individuals. Now, everything is relative. Now, the seed on the frond, depending on your viewpoint, because the seed contains the tree, so would the seed consider the tree to be more powerful than itself? Do you understand what I am saying? Yes. I don’t know if the seed would consider the tree to be more powerful than itself because how much would the seed know about the tree? Would you consider a small snowflake to see a large iceberg as a more powerful, as an entity capable of more powerful action than itself? Would it realise that? One imagines it would. It is a question of whether it realises the iceberg is made up of lots of snowflakes. That’s the assumption that you need to make. Of course, but that is awareness, that is awareness. Do you think that the snowflake is not aware of other snowflakes? No, I think they are aware of other snowflakes. Yes, and so if you as a snowflake and you are surrounded by lots of other snowflakes, how does the human being or any animal in a pack feel, does it feel more powerful than it does when it is alone? So angels, I have given you now a tree, the seed, the snowflake, and the iceberg, the human and the crowd, the animal and the pack, so now take consciousness and angels. Do you understand? So what are you saying? An angel is a multiple of consciousness? It’s a massive consciousness and therefore has much more power at its disposal, much more intensity than the smaller gestalt. It is the mountain to a grain of sand. It is the tidal wave in the river, it is the adult of the child. So should we ask for help? Does the child ask the adult for help? You have your own answer. Is consciousness connected? You have the answer. But you have fashioned your belief. Instead of the word angel, if you said I am going to ask that big consciousness, but that is exactly what religion is, praise to god. It prays to the higher, larger consciousness, it calls it power, it calls it higher power, it calls it various names and it prays to something bigger than itself and because of the nature of hierarchy that you are used to here, you set up a hierarchy of beliefs in various, various larger consciousnesses and you give them names, because you give each other names here. But just as stripped of names, and stripped of jobs, and stripped of locations and stripped of reflection, stripped of light, then how would you differentiate one human to another? I was trying to bring the analogy to the earth. Put all humans in the dark and just have the voice how would you differentiate between one and another apart from the voice? By their thoughts, yes, so.. I think we may have spoilt the analogy here somehow… Basically there is no need to give a hierarchical aspect to all these angels, archangels, gods, etc. excepting where you focus your attention. If you wish to focus your attention on a very large consciousness then you pray to “all that is”, then you think,” shall I be heard?” If you want to pray to a very local consciousness, a small consciousness, but then you don’t believe that the small consciousness can do what the large consciousness can do, do you? Yet, what you don’t pray to is your own consciousness. If you listen to your own consciousness you will know what to do. In-tuition. There is no difference when we say creating reality to a child playing with a pile of bricks, it is all relative. A child playing with a pile of bricks is creating his reality where he is focused upon at the time. You are creating your reality that you are focused upon in this moment. You are both creators in your own way and so is everything else. Everything is fulfilling its desire. On another level everything is known to be a creation, your own creation. When you say, your own creation, we can only be an absolutely miniscule part of this creation. Our thoughts can still only create a miniscule part of this creation. Every part of consciousness focuses upon an area of interest and when that area of interest reaches a certain intensity due to the amount of focus upon it then it manifests. If you no longer wish to be part of that focus, that intensity, you turn your focus away from that. Explore your creative abilities. If I design this can I design it such that it can survive, it does not necessarily have to have a purpose, as we have described purpose before. There is no overarching plan, there is simply design that can survive in the environment in which it is proposed to exist. You will have noticed that as species have become extinct through the ages that life goes on regardless and so the theory that everything has its place and is interdependent is somewhat flawed. As one species ups sticks, shall we say, then the remaining find ways to fill the gaps and as we discussed previously nature returns to equilibrium. It is not only the humans that are forever becoming, all that is, not in the conception held of an omniscient power, but all that is expressed, all that consciousness, manifests in the universe. All is forever becoming in the co-created fashion, if you care to think deeply about co-creation and new focuses, new design, new manifestation you will see that all around you all that you can be aware of is forever becoming. There is no plan, there is no purpose except that which each consciousness chooses to be part of. With regard to co-creation do we form the future consensus reality by the higher consciousnesses talking to each other and deciding which events we are going to experience in the future? As you have already transcribed, you are in the guise, shall we say, of your higher self, talking to each other at every moment asleep or awake and you are recreating, let us say, fractition (unable to decipher, maybe somebody can suggest what it should be!) numbers, fractally altering your physical instrument at every moment and as you do that you are also, in co-creating terms, altering your environment fractally at every moment. You must be careful not to think that you are creating everything around you because you bring separation back into your beliefs. It is hard to understand but everything is linked together, all information is linked together, all consciousnesses are agreeing. We can only explain this to you in terms of information transmission that is of such speed, it is, of course, instantaneous, you cannot understand that, but you can understand to some degree superluminal speeds and if we can say superluminal speeds to the power of 50 say then that goes beyond your imagination and becomes akin to instantaneous. So, if you can say that multiple decisions and by multiple we mean infinite, are being taken upon agreement between infinite consciousnesses as far as you are concerned, to constantly create the agreed environment in which all find themselves. Is that too convoluted for you? I am sure that once it is transcribed onto paper it will be easier to understand. All is happening at once with the agreement of all concerned. Yes, thank you and is there any difference between to form and to create? Back to language once again, as far as your language is concerned, what does form mean? Now you can form something according to an agreed plan. Now you can create something but it had to have an idea behind it didn’t it, it did, therefore what is that but a plan. So, what is the difference between create and form apart from your own semantics? Very little. Why does everything have a unique fingerprint or mark? Why do your phones have a unique number? keep going. What does your phone do? And makes calls to other phones. Could it do that if it did not have a unique signature? Why everything has to have one. You have, there you are, not difficult. Now, we recently discussed no space and no time and perspective. We also discussed creation by one person of a reality and the invitation to another group consciousness, shall we say, to join in that reality and have a coffee overlooking the Mediterranean. In other words you accept the reality that has been constructed, accept it as your own, and join in and both enjoy that reality. Because one group has co-created it your group just adds its weight and joins in the co-creation and maybe puts in a few flourishes. Now, if we start from the assumption that all is consciousness then unless we come back to the one god, one mind etc. breaking itself into myriad pieces and forming all different realities all over the place, much like the Big Bang of course, how many scientists see the parallel between the one god supposedly investigating all its potential and the one little speck exploding into this vast infinity that surrounds you? So where do we start here? Do we start at the specks? Or do we start at the tapestry that has been created? And you can take your choice. You must remember that we are still arguing the toss about this over here. So let us apply our usual reason and logic to this discussion and look at the tiny little local worlds that you are familiar with and by this we mean your daily habits apart from your occasional holidays. Your daily habits are in a tightly knit circle of operations which when considered in terms of your locality, your country and the world you exist in, is really very small. So would you think it would be sensible to create all this other stuff just from the point of view of having to wonder what was around the corner, what was on the other side of the world, what was in that jungle, what was this, what was that? Of course if you were the higher consciousness creating it all, you would know, so why would you create it all if you were never going to investigate it? So does it make sense that the rest of this tapestry is composed of higher consciousness groups, some vastly bigger than others? It is not easy for consciousness with a certain experience and focus, even though we are talking no time here you have got to remember that some venture, some don’t and that there are areas of activity, areas of quiet. Now you would not personally think about becoming a rock in the centre of the earth and yet there are some who would think “I would like to travel to the centre of the earth to see what it is like. I would like to be there to see how it works”. And if you can move your mind to this it is as good an investigation as any, isn’t it? You can move your mind to the bottom of the sea, you can move you mind to the planets. These consciousnesses have their own being and their own methods of communication but you have to join in with these things and if they don’t catch your imagination, like any other idea, then you let them pass by. You could for example take a look at the sun, just a mass of burning material and explosions and think, what would there be really interesting in that? So would an infinite number of other consciousnesses. But some who have been involved in that sort of thing and it is the only reality they know find it quite enjoyable because what you consider as extreme heat and disaster they just experience as another reality as nothing affects consciousness. They simply don’t take on the attributes that would feel the heat that you would, because it is a different reality. So it is so difficult to explain to you that your senses are only suited to your reality. They may be completely unsuitable for another reality and yet there are senses that are suitable for that reality but they have no counterpart or comparison with the senses being used in this reality. To answer your question, do you think that there are more than just group consciousnesses that are involved in the human life? If you accord all particles, waves, consciousness with imagination and ideas then you can see that, around you if you think trees are conscious, trees far outnumber humans don’t they? Stars far outnumber humans, galaxies even do. So the human aspect is a tiny, tiny part of the whole. You might say, for purposes of giving you more of an idea, that you can fit your imagination within a larger imagination. Somebody suddenly spreads out before you an amazing picture, which you both know of course is a product of imagination, let us say a hologrammatic image to make it easier to understand or just a 3D image, and then you see a little corner of that image that looks very inviting and you think “Ah, look what has been imagined over there, that looks absolutely idyllic. I wouldn’t mind spending some time there”. And as you focus further you see that there are some interesting things there and you think “I could do this and I could do that” and your fellow consciousnesses come up with their ideas and before you know it you are constructing your reality in the corner of another reality. Why do it all yourself when there is so much other consciousness all creating wonderful things to explore? Now you are quite happy to say “let’s visit this other reality that other consciousnesses have constructed and we just have to fall in with the laws and parameters, the thought patterns etc. in order to experience that reality” but wouldn’t you say that you are experiencing another reality? You are experiencing the reality of a little corner of the earth. You are able to explore it nowadays whereas you could not have done, in terms of time, before. But as your imaginations have expanded so you have been able to expand your dis-covery of another vast imagination and out there are all the rest of what you consider to be stars, galaxies and various other objects in the universe and so it gives you a vast area to explore for many, many visits and many, many ideas of what shall I do next without having to sit there and scroll through lots of ideas and join one only to find that it’s still born. So, as we have said before, most consciousnesses are followers. They take advantage of what the visionaries have constructed and simply piggy-back, shall we say, in order to take advantage of what has been laid out and of course these are often welcomed because the person who plans on a vast scale is often not the consciousness, the group consciousness of course, that is one for the detail. It is like somebody that is great at painting landscapes but not much good at painting objects or figures, people, animals etc. Not much good at putting together working models, shall we say. They are great at seeing the wider picture, painting the whole vast scenario. So then myriad others are needed to make it really interesting, really become alive. Do you understand all this? The questioner also asks “Can we still access this universe when we are back in the spirit world? The higher consciousness can focus anywhere it wishes to but again it has to focus otherwise it is simply randomly searching without even perspective and to see you must know what instruments, what senses you need to see. Otherwise you may be using senses that will not pick anything up. It is like using infrared to try to see the bones within the physical body, you need X-rays. You need to use the correct senses, the correct frequencies to probe. This is another area where to draw analogies is again so difficult. Yes, you can see wherever you wish to see provided you understand what you need to do to see it and of course that is chicken and egg because unless you know what it is that you are trying to see you won’t know what instrument to use in order to see it. Measurements again, perspectives. The same with focus. Where do you focus? You focus at a distance don’t you? When you go searching you narrow your focus into a searchlight to pick up something of particular interest. So yes, you can go look for whatever you wish to look for, you just need to have some idea of what you need in order to find what you don’t even know you’re looking for. But you can say yes I’ll go off to that particular star and you may or may not see what is on that particular star depending on the laws pertaining to any form of activity that is going on there, if any. Again, it is back to the imagination. We come back to the fact that the vast visionary background is laid out and various consciousnesses chose various corners to set up their own imaginative activities, so you would have to say yes, wouldn’t you? Now we have tried to straddle two horses here, in that we are trying to show, in order to head off the obvious question that it is all in the imagination and there is nothing out there, that there can be a big “out there”, as we have just described, in the imagination and there can be small “out there’s” within the big “out there” from other groups doing their own imagining. Have we got that much across to you? And at the same time if you wish to think that this is all nicely laid out just for human exploration then so be it. Wouldn’t you think that where you cannot see there is probably plenty of activity in much the same way that you couldn’t see the activity below the solid object, body at one stage and yet now you have got all the way down to waves that go into and out of existence. So if you build up invisible beings that can still think and be visible to each other using the right senses then many of those worlds can be populated in just the same way as this one. Then if you called them, let us say, spirit beings, you wouldn’t need the air, the water, the food and yet they could still create their own reality within that, living an entirely different life. Now you would accord that to the astral world, shall we say, where you don’t need to eat etc. etc. and you are happy with that so let’s say that there can be innumerable astral worlds out there. So even if you go to what seems like a barren planet to you here then the imagination once more can create a valid reality within the “reality of that barren planet”. So you want us to talk to you about the nature of matter. Now as you have concluded, there is no matter. There is only what you want to conceive of as matter. That which you wish to make a belief in. A belief in matter, something that you can organise as props and scenery in which you wish to carry out your imaginative series of events. It is true that you have to devise a system of numbers and measurements, angles and the rest of it in order to communicate with one another as to what it is that you wish to perceive and jointly agree on. This makes it easier to do so. If you have a system of measurements you can all agree on and further agree to use then one metre, 10 metres and so on can all be understood and visualised. The meaning is common to all. The same goes for all other measurements. It is easier for intercommunication to have standardised systems of measurement in order to construct the illusion. As you can imagine, if you can imagine, and you must imagine, the scene whereby the plain is flat and the mountains are high must be seen proportionately the same by all, all must use the same scale of measurement. So measurements have even got to be used in transferring the imaginative concept to another imagination so that both can construct their imaginations in like form. Are we making sense to you? As above so below. You are aware that you are measuring your rather diaphanous, hard to see, hard to grasp, what you call reality in terms of measurements but as you can only bring this down in your conceptualisation to forces and so-called magnetic fields, waves of light, you have no real idea of how to manipulate these in order to construct reality although you are getting somewhere when you are starting to organise your virtual realities in holographic form. Even so you cannot understand how this could be projected from one mind to the other, one consciousness to another and yet if you even say to one another “look at a mountain range of so high and see in your mind a mountain range and now look the other way and perceive a mountain range much higher” and you will be able to do so. So then ask the other to picture at the foot of that mountain a vast forest fading away into a snowline with snow above and slowly in your minds you will be able to see that, and so on and so on. Now imagine that you have a mind capable of holding all this information and keeping it stable. Many of you all holding that imagination in your mind. Then move forward along your imaginative road, passing your imaginative buildings and lakes and gorges and forests until you all start to agree “yes we see that, yes we see the other, look how deep that is, look how high that is”. You are all agreeing with one another. Slowly it goes along and your systems of measurement are becoming beliefs and as one says “that’s a high mountain” you all see a high mountain. It becomes a consensus of belief, a habit of belief. As you see with the flocks of birds and the shoals of fish, as one begins to turn all begin to turn. So you can imagine consciousness all seeing the same reality because the decision to turn equates with the decision to acknowledge the perception of one instantly appreciated by all and therefore accepted as a reality i.e. believed in! (so maybe we have a ‘group soul’ the same as the much looked down upon animals, birds and fish. Humble pie for the hubristic human ego). We are back to our previous discussion on make-believe but rather than the word ‘make’ we use the word ‘choice’ to believe. Yes? So consensus choice to believe is what imaginative reality consists of. We are trying to make this as simple as possible you understand. Something that you can actually form in your own mind and then understand that others see the same. If you lead a guided meditation with everybody having their eyes closed then you can gradually get them to agree that they are seeing the same thing. They will have their own context and biases of course but if you took the average of say, several thousand or several million of those who are listening and are agreeing to the measurements as propounded by the leader of the meditation, a roughly consensus average would come out of that. You will have the spread from one extreme to the other but like any statistical presentation you will see a bell curve, so we ignore the extremes as they just have to go along with the vast majority who carry the day with their conception of reality. Much the same as in your human consciousness where you all agree ”this is real”. Whereas on the outer edges you have the mystics, clairvoyants and others who say that it is not quite as you see it. At the same time the scientists, as regards the belief of the mass, are saying this is all illusion, this is not real, it is just electrical charges coming into and out of existence, there is nothing there except forces. The mass however says, I don’t care, you may be right, you may be wrong, but to me it’s solid and it’s usable and that’s all I care about. Let’s face it this is all your experience is meant to be, all that you care about. You don’t care how it’s made. You are happy to believe in it because you came here wishing to believe in it so why on earth would you wish not to believe in it? Because then your experience wouldn’t be experience. Switching focus – Switching realities. When one is in a higher state of consciousness how easy is it to switch from one focus to another without being lost in the drama? It is all a question of duration. As we explained with the actor, the longer you are in it the longer you feel that you are the part you are playing. However if you just dip in, bring yourself up to date, shall we say, or make your contribution and then dip out again; I think you had occasion in the past with your own speculations of sitting in a theatre in the round where there were half a dozen plays going on at once, much like sitting in a multiplex cinema where for example you would have six screens around you but shielded by intervening walls in triangular tunnel shaped divisions so that you in the middle as you turned your gaze was filled with another film. Let us call that another play and then amalgamate that with our analogy of sitting in the back of the theatre but focussing on the stage. Now if you were sitting in the middle and you compare that with sitting at the back of each theatre, back of each of the six theatres, but there was an automatic focus switch where simply by focussing you could be on the stage and indeed being one of the parts. Because you are a quick change artist after all. So, as you look from one to the other you could either take an observers view of what was going on or you could focus straight in and be on the stage. If you knew you were just going to focus in on the stage and perform some action or speak some lines then you would know that you would retract straightaway. Whereas if you focussed in knowing that you had a lot to do and you didn’t know how long you were going to take and it took far longer than you expected then just like the actor who spent some years in the play you would find yourself lost in the drama to quite some extent. However, you have always got your higher consciousness which although it has one aspect of itself lost in a particular drama is still dipping in and out of others. It is not lost in each drama. There is always a central control. Now this does lend itself to a complete comparison, shall we say, to your consciousness being aware in a dream, a lucid dream. You are aware that you are in a dream but in most dreams you aren’t aware, only some you are and then you know you are actually laying in bed somewhere else. But, when you become conscious in a dream, is it your higher consciousness, shall we say, reminding you that “don’t go too far with this, we need you back here”? This is all degrees. As you know, the total consciousness is however many want to join in at one time and so you can have more than say the normal amount focussed into the physical. Something interesting happens and others want to experience it, they can temporarily join the physical expansion as well, but there’s always the ones who want to stay back at base. This may be by desire or by design in order that you don’t all get lost in the drama. But you never will because there are always others watching that aren’t even particularly connected and if they see a certain intensity diminish too fast then there is always someone who can jump in. This doesn’t actually happen but of course you can see that it can. Look, that person’s drowning, go and pull him out. That person’s immersed so let’s pull him back above water and remind him “don’t go in there again too far”. It’s all quite simple really but of course if it is something very enjoyable then you may want to stick around for a while. Other times when you look in and something particularly gruesome is going on you may want to look away again quickly. Once you run a few scenarios yourself you can soon see what is likely to hold you there and what isn’t. Has that given you enough to play with, to understand that there’s always someone around to pull you back? Thank you for a very comprehensive answer. So it is all down to ‘thought power’. That is just a my friend Brigitte Rix stated in her books. Yes, it all ties in. Many thanks, and bless you. Thank you, David Jackson, for your great questions, and thank you, David, Jean and your spirit sources for the wonderful answers. It is so liberating to know that through the application of our imaginations and focused intentions, we can connect with other realities and experience aspects of our own world that seem to be beyond our reach. Imagination is indeed a powerful vehicle for the expression and exploration of consciousness, but the main lesson in this reading for me is that in order to see beyond what is already known, even higher consciousness “has to focus otherwise it is simply randomly searching without even perspective and to see you must know what instruments, what senses you need to see.” To me, this statement is as relevant to what we might call ordinary consciousness as well as to higher. That is, I suspect, what all the spiritual traditions originally sought to develop in us – the perspective, instruments and senses needed to experience and comprehend deeper dimensions of our reality. Perhaps that is also what science at its best could help to develop, a richer, deeper awareness of the perceptual and mental tools available to us, far more than ordinary perception, physical experimentation and mathematics. So much food for thought here, and so much inspiration to keep those ‘gates of perception’ as wide open as possible at all times. When we go over to the other side all the consciousnesses that are part of our makeup, shall I say, could want to go off and do something entirely different so where does that leave us? Do other consciousnesses come and join…..
You are fluctuating all the time. You have within your own group a group of like minds, you might say, that tend to, like a flock of birds or a shoal of fish, follow the same thought patterns simply because they are of like mind. Not because they are following a leader or anything like that, they just hang together because there is a certain amount of enjoyment in feeling the enjoyment of those you, you might say, love. The sharing of enjoyment. Now as the ideas float through and you are looking at this idea and that idea then, it’s just like magnetism, consciousnesses are attracted. So as you look at one idea a number of consciousnesses are attracted, you look at another idea a larger number are attracted. Can you imagine? Sooner or later one takes your fancy and you think, we’d like to do this and then others realise that this could actually be a probability whereas previously you were scanning possibilities. So consciousnesses may stand off a little when they realise you are just scanning possibilities but once you start to zero in on something and people feel it is going to become good-to-go, you might say, then they decide to join the party. It pushes them over the edge. “I wanted something else to do. This looks interesting”. So they join in their little bands as well. They are not all swimming around out there in singularities you know, because the whole point of coherence, coming together to experience something, doesn’t just start when the physical body is about to be formed. The idea starts to attract and once you are scanning ideas you scan ideas in the company of your like minds. You can again look upon political parties that come together. If you’ve got half a dozen parties of the left then whoever takes the lead and gets the most votes the other parties still vote left, they don’t go and vote right do they? So you have got like inclinations of small groups so when the idea comes up then if they like it they’ll join it. Now there could be another idea from the other party, you might say, but you are never going to like that idea. So take this as your light and dark, there is one group that are war hawks, they enjoy the game of war so whenever they see a war game about to be played they rush to join because they find it exciting. Now another group may like the idea of loving animals and so a life spent caring for animals in some form may attract in much the same way that you are attracted toward a particular career when you are here, but actually you were attracted toward that kind of life in the first place. Do you understand? You have got these groups of consciousnesses looking for a reality to join into and like anything else at some stage you say “We’ll do that one”. Of course at the same time you can be doing several others as well. Additionally there are times when, even though you are a group, you may belong to more than one group because although you may want to do the animal loving life you may want to also be involved in a life where verbal debate is featured so you may take a life as a politician say. You can experience more than one thing at a time which is why you take several lives simultaneously. Do not think that you restrict your areas of desire to one any more than you do here. I think you may have misunderstood my question, what I was asking was, how much of this remains with us once we move over to the other side to keep us recognisable as who we are? What have we just said? We will go back to what we said before, we never know how many consciousnesses are tuned into the instrument at any particular time and yet the instrument is recognisable. So is the instrument recognisable through what I would call the blueprint rather than through the consciousnesses? Well, how would you activate a hologram, once the physical body has stopped how would you activate say a hologram or an astral body or any other body for that matter without a pattern? So there is always a pattern, then it will only take a certain group of consciousnesses to activate the pattern. Of course, as we have been saying generally consciousnesses are in groups, which is where the idea of group souls comes from. Group souls reincarnate together, only this has been said as group souls as a band of actors, therefore giving the impression that the group was a group of singular consciousnesses, whereas it is much deeper than that. Singular consciousnesses group together of course in order to enter into the realities, in order to create the realities. They can only co-create, you don’t have the amount of imaginative power to create on your own but it feels as if you are on your own, because when you cohere together, then you are all strapped to the same stage coach or the same sledge or you are all pulling on the same rope. You all feel the same sensations and you all consider yourselves as singular because it is easier to consider yourself that way. Comment:- All participating consciousnesses consider themselves the “I”. So as set out in “Entangled Minds” thousands consider themselves as Joe or Joanna Bloggs or any person you care to think of. We are not as unique as we think we are! Now in other realities you are aware that you are part of a group. In this particular reality you only see yourself as a singular, even though it is plain to see with a moments thought that your body is composed of many but that is how it is and as I think we have said before, but who do you argue with in your mind? Shall I do this? Shall I do that? How come there is a for and against, protagonist and antagonist? There are two opinions, so there are two intelligences. Just work that one back for yourself and then when you go to two you might as well go to two parties again with numbers making up the two parties. Once you get this into your mind and think this way that the single unit of consciousness feels once it has cohered with another number of consciousnesses which at any one time can vary from enough to participate in the game to a thousand times that depending on the match. Now, if you are playing a home match against the local derby side, Liverpool and Everton for example, it will attract 100,000 consciousnesses to watch that match, but if you are playing an away match at the other end of the country against a team that is at the bottom of the table how many supporters are going to travel that far? See the idea? What is happening at the time depends on how many people get involved, but, of course, they are all “I”. Entangled minds once more, they all have the sense of “I”, while they are focused right in there. “I” experienced that, in fact if you look at it that way and say to yourself, “I” experienced that. When you recount the experience to somebody else you would say, ”I did this, I did that”. You would not say, “I was part of a whole bundle of people doing this thing together, well did I experience what everyone else experienced? Of course you come back to the fact of yes I did. You use the easy phraseology term, “I experienced it” your sense of “I”. If you can approach these questions from that view point you will find them far more easy to understand although of course, you like everyone else are reluctant to give up the sense of “I” until you understand that you haven’t given up anything, you have experienced it just as much as everyone else has and been part of the co-decision. Sometimes you will feel, I know I am doing this but I don’t know whether it is right or not and so I hope it turns out okay. That is because you are having to go along with the group decision even though your particular group consciousness is a bit ambivalent about the whole thing. If others have joined and you are temporarily overpowered, shall we say, outvoted then you go along with it anyway, because you have no choice. Yes it gets quite addictive. There is much excitement at still being able to speak in the physical. Imagine if you had a machine which you could switch on and talk to those in the non-physical. How rare it would be, how exciting it would be and even though you may not be able to get through to exactly who you want to get through to just speaking to people on the other side as you are now able to do is extremely interesting. This is the same for us of course. Even though we know what is going on it is still quite something to do something that others aren’t doing because we are to a certain extent exploring another possibility of the higher consciousness, as you call it, being in closer contact with the instrument. There may be another possibility explored whereby the consciousnesses are in far closer contact with their instruments so that there is a greater degree of control and the idealistic scenarios might be more able to be brought into being and the nastier aspects as we have agreed with you to call them are minimised. So that there is to some degree, heaven on earth but being able to utilise the solid physical bodies and environments in such a fashion that there is less heartache and fear. All realities are possible and while this one will be kept going in its present form, the one we have just described might be organised in another reality. You can look at the different ones and decide whether you want the uncertainty of the nastier sides breaking into your reality or the more certain knowledge that these things can’t happen in this other reality. Therefore you are shielded from those sort of experiences. For those who have been through those experiences and simply don’t want to experience it again then wouldn’t you think it would be the thing to do to say ”let’s get together those who don’t want to experience violence, pain, loss again yet still want to enjoy a physical life”. And why not? You might decide to take time out of it as well, so you create a physical reality with no time, no degradation and you can come in at whatever level you like and if you wish to change levels, i.e. projection of ages, then everybody understands when you suddenly say “I’ve had enough of being a five year old, I am now going to become an adult, OK with you?”. “Sure, off you go”. So there wouldn’t be all the associated traumas with how are they going to turn out, how they are going to earn a living etc. To do this of course we are going to need to have a different method of energy production, food production etc. or organise a body that can live on the sun’s energy or water or something relatively easy. Also have mind to mind communication and projection so that you won’t have to have vehicles to shift the body around in. You may as well have your holographic Skype which obviates the need to actually go somewhere and the ones you want to interact with then live in those particular areas and only occasionally will you want to go somewhere else. Who knows, we then may just recreate the body in another location. All in the future, you might say, all in the planning, all in the works. All the potential exists for this of course. As yet we haven’t found it. Maybe it’s there though and we haven’t discovered it but we can all imagine, as we all do, and we all exist in the product of our imaginings. So, you have questions? I would just like to comment on that you were talking about the future. Everything is potential. If it hasn’t been dis-covered yet, hasn’t been tried out yet, does that mean to say that is the future if it all actually exists in potential? It hasn’t been experienced yet but maybe it has. It is a vast area and just as you can’t explore all parts of the universe that has been created we can’t explore all parts of consciousness. Although everything is interconnected we have to know where to look, we have to know what to ask for, so if we imagine this reality and then we start asking, putting the thought out, does anybody know of this? Then it may well come back to us, we have tried this before, or whatever. It is all there in potential, when we say no time everything exists, it is a question of whether you focus upon it or not. So from your point of view in the physical you can say, “well that is a future focus of mine”, using the word future where it is basically an alternative focus. It is these words again, language once more, this past, present and future. If you took those words away and just said alternative focuses, then how do you get time into that? Apart from the fact of sequentiality. Yes that’s where it comes in. So, once more you see, you basically can be whatever you want because as your basic unit of awareness doesn’t change then there is no time for you. Everything is in potential, open the oyster, where do I look next? Because time doesn’t matter, put it that way. You create time in this world for a reason, in other worlds you will not bother to create time. I was going to ask whether any of your group have lived in other realities but then I realised that was not a sensible question. When you think of what you are saying then think about the words coming out and you have to listen to them. You are not forming them. They are being formed by a whole bunch of consciousness. Each of those consciousnesses has experiences of all kinds and so when you ask “have any of you”?, how do we get agreement quickly in order to get one particular life in one particular reality where perhaps only a small percentage of the consciousnesses have experienced that reality and they will be different experiences so how can a single experience be put across? We can only put across a group experience. Every group experience is different and is constantly fluctuating. Yes. I realised that which is why I said it wasn’t a sensible question. As we said last night due to different senses unbeknown to you that may be used in other realities it is extremely difficult to describe environments which none of your senses could comprehend. You are only able to conceive of worlds similar to your own but simply vibrating at a different rate and therefore invisible to you whereas there are innumerable ways to experience states of being. You will be able to explore and understand more when you return to the back of the theatre. You can’t do it while you are still on the stage. The first thing you will do when you move over will be to construct your new realities in conjunction with others in the fashion that you have been used to and you feel comfortable with. So the realities that you wish to put together with this particular band of loved ones, friends, acquaintances and others you will find have already been constructed by the ones that have gone before but as generations go over these will evolve as well. In terms of the gradations, as each wave, shall we say, goes over it constructs the reality to suit its comfort zone, much as music tastes change with the different ages. Choice is infinite and you will have many different realities that you care to focus into. Just like having a number of homes in a number of countries with different cultural amenities. Your house on the beach, your house in the country, your apartment in town each with their different range of activities and social connections. Take your own favourites and imagine that if you could construct everything that you wanted to what would you do? Would there be people who would like to do the same and when you say “people’ there will be other group consciousnesses won’t there and they will have created many realities. Which ones will you choose to focus into, become part of? As your Heather said “Over here there are heres and theres everywhere” and if you think about that it describes what we have just talked about. You construct all your realities to suit. There are those who go in search of other realities just for the sake of exploration and discovery of something new. Once more as above so below and vice versa. There are those who sit on the stones and those that turn over the stones. July 28th 2017 All Worlds are Thought Worlds, All is Always Connected. The whole idea of “reality” is that it is put at “arm’s length“ in order to try to experience a separateness of self. There is a popular hypothesis that we are living in a gigantic computer simulation. This depiction of reality, or not, seems to be a physically centric version of your statements regarding our reality. Many of our scientists, technologists and others in the last few years and some before have been speculating as to whether physical reality is actually a simulated reality and that we all may be living in a computer simulation, let us say, in that there is some controlling being or beings that are producing what to us is reality whereas in effect we are merely ciphers being manipulated by others of which we know not. According to your previous analogies, with reference to the cheetah for example, then it seems to me that the so-called simulation is actually a continuous refreshment of the elements of a particular reality either by perfection of design or evolution by allowing various differences to emerge or simply experimentation. The reason for this would be that the original idea was continually being expanded upon so as to ensure continuity of experiences that are available for those that wish to participate in them. Now could you just give us your thoughts on how this reality is produced? We understand that it is imagination, we understand the artist connotation, we understand the getting together but as far as we are concerned we have to use physical terms so we use “computer and pixels”. When it comes down to a thought world we can understand that it can be pictures in the mind and you say there is no space, no time and no distance to travel so instantaneous. How can we have any idea apart from relating back to the origin of the ”Big Bang” and imagining consciousness compressed into a single point? Although this has been a rambling statement I would appreciate your clarification to help us grasp more fully the actual position. As we stated in our last session it is impossible for you to grasp the attributes of the non-physical in terms of the physical. In relation to the analysis as expressed in the question/statement then yes you could look at the totality as being just a point, but how do you see that point? You see that as a point in space or a point surrounded by space so how could you possibly envisage a point with no space surrounding it? What would that point be? Because you couldn’t envisage a point if it didn’t have space surrounding it. Can you see that? This is one of the problems in trying to get these explanations over to you. The human being has grappled with this enigma ever since they set foot on the earth. Ever since they were first imagined, and we are no further forward, simply because there is nothing to stand outside of. How do you envisage that? There is, let us say, ”nothing”, but you are fully aware that out of the seeming “nothing” comes everything. You are aware that the waves/particles emerge from the “void” and disappear back into the void, yet you have no idea of what the void is. You must remember that we are but one step removed from you from where we are speaking at this present time and you must also be aware that, just as we don our goggles or diving suit, you might say, to focus upon physical reality, we also have to block out other information which does not pertain to this. If we need to go beyond that we would have to do this in a step- down procedure and that is not as easy as it may seem. So it is very difficult for us to give you information that will enable you to get a clear picture of how this happens. Let it suffice to say that, as you outline in your statement, the idea first arose in the imagination, it was embellished upon and expanded and added to until the world as you know it formed. So the parallel runs along with the “Big Bang”. It started, it expanded, it coalesced and various evolutionary paths came into being and it resulted in the position in which you find yourself at the present time. Now you are indeed correct in restating, as in the cheetah analogy, let us say, that the original idea is continually expanded upon because you couldn’t have a cheetah that resembled a kangaroo as you would wonder “where the hell did that come from”? “Did they cross it with a kangaroo? “There aren’t any kangaroos where the cheetahs are and vice versa” “How did that happen”? That would set off a whole line of mystery and enquiry as to the nature of reality in which you exist and as we have said before, that would rather spoil the show, wouldn’t it? So everything is moved forward by degree. It is just like a soap opera, we keep putting in new events, new angles, new things to look at and make sure that you can understand how they have been arrived at, how they have developed. Through technical, through biological, whatever. This has got to be simply so that you can feel that you are able to discover, to advance, to create. The creative urge from our side is expressed in each reality, in some more than others. Some are, what you might say, holiday realities, rest homes, “let’s just enjoy ourselves here and leave the creative bit behind”. In other realities the creative ability is given full rein and so then you advance at a certain rate. Each reality will have these elements where you will advance at a faster rate in some than others. In some cases you will decide that you have exhausted that line for now and move on to another one. Alternatively you may decide to change the parameters and we will have to do that in such a way that the story line is changed, much as in a soap when an actor decides to leave the show he has to be written out and a replacement theme adopted so that the continuity is preserved. So when you talk about computer simulations, the reason the word simulation is used is because the writers are wary of saying this is a product of the imagination because although they create the virtual realities they find it difficult to acknowledge that whatever is creating the simulation has to be separate from the simulation and so they infer that it is advanced beings or aliens or something else, of course the word “being” or “alien” denotes another “pseudo human”, shall we say, even though that is not alluded to, rather than attribute it to an invisible consciousness. Once you come out with the idea that everything is just consciousness, which has been stated by many of your most eminent scientists and philosophers, it generally hasn’t been taken any further as to how did consciousness arise. It has been put forward that consciousness is an epiphenomenon of the brain, say, then the word ”mind” comes in and yet what is “mind”? Is mind part of the brain? Some say yes, some say no. What controls the mind? So we are back to the consciousness again aren’t we? This is an area where mathematics are rather left behind. Mathematics are part of the underlying structure of physical reality but do not have any relevance in non-physical reality and if you don’t have any mathematics, and you don’t have any senses, apart from your meditative connections, shall we say, then how do you measure this thing called consciousness? So this area is steered away from. If you can’t use maths and you can’t use your laboratory what can you use? You can only use your thoughts and if concepts emerge from thoughts they are usually treated as philosophical theories because scientific theories generally need to be underpinned by mathematics to prove the theory and with consciousness that cannot be done. This is one area in which, as we stated before, it is going to be impossible to give you an answer. So, by all means, treat it as a computer simulation but instead of having your being, alien, programmer programming this so called computer, even though that may be a 2D pixelated universe, why not substitute that by consciousness imagining, in their mind, and we cannot expand that because you cannot understand mind. Near death experiencers, when outside the body, what are they using? They are not using the brain, are they? They are using the mind, but they cannot express themselves until they are back in the body and therefore what does one say. How is the brain involved? It is seemingly not involved and yet it (the experience) could only be expressed by using the brain. Using the brain as an intermediary factor to operate the voice box in order to tell of the experiences. So how does one show that the mind is separate? Now to some degree we are proving the point as we speak except for the fact that some might turn around and say that this person may be able to formulate all this in view of what he has learned over the years. Perhaps he is using his innate imagination to form these concepts and voice them in a relatively seamless manner. Non-Locality, No Space, No Time. Now when it comes to non-locality, this is something that is spoken of but is simply impossible to envisage. You are equipped with senses to see space, you are totally immersed in a time based world, so how can you understand a situation where everybody is surrounded by their own creation, be it co-creation or not, when we say ”own’ it encompasses all of those engaged in the particular reality in which you find yourself. The same thing applies to time, just as space expands in all directions around you so does time. Your mind expands back into the past and then forward into the future as you simply apply a system of measurement to it. So you have a measurement which you can measure in terms of your both written and perceived history and in your speculation as to the future that you can put a relative degree of understanding upon 1800 and the year zero, the year 400, the year 1100. You can place buildings there, you can place names there and when you go forward you only have a vague idea, but you can, to some degree again, speculate as to forms of transport and other forms of energy etc. some through extrapolation some through pure speculation. But when it comes to bringing yourself down to non-locality, no ”where” no “space”, what is it? Because even if you think that you see what is all around you and you are a point of awareness you still have to think in terms of “space’ because in order to see you must see light reflection and therefore you will measure the distance the light reflects from. Yet when you see in your mind, where is the “space” then? Do you think you see in your brain or do you think that you see in your mind? Now near death experience, out-of-body experience don’t really shed any further light on the subject as normally you are seeing other environments within you present physical reality. It is only in dreams that you find yourself in other realities and even then, have you created those from other scenarios that you have been browsing and simply transformed them into something you understand? Or, have you been out-of-body during the sleep state and just found yourself in a strange house or a strange location with people dressed in other forms? Once more, were these other people’s dreams, other people’s fantasies, mind creations? It is all very difficult. So how do we find some form of analogy that enables you to get some glimmer of understanding with regard to “no space”? So we came up with this idea that just as science reduces everything you see to a single origin, be it particle or wave and then suggests that everything is composed of numbers of these entities, so let us do the same thing to space. And the easiest way we can find is to say to you, imagine that your kilometre is only a millimetre, but use the same sense perceptions that you are already using and so reduce 5000 kilometres to 5000 millimetres. That immediately brings the object from 5000 kilometres away to 5 metres away, which means, you are already there, instantaneously. Now you have heard through various transmissions etc. that you just think of somewhere and you’re there, but how about you think of somewhere and it’s here? In your mind. Just as this reality is in your mind, in your imagination, so is all the reality that you think is at a distance from you. You know of it and so you can envisage it. That enables you to imagine yourself “being there” when you think it is only 5 metres away, “Here I am standing there right in front of it”. But then, has it come to you? This applies also to the creations of others. If they are all existing in the same space as you are, all consciousnesses exist in the same space as you do, this is where your concept of the “One”, “All That Is “, “God” comes from, and yet it is made up of innumerable awarenesses. So is it the sum of the parts or is it a whole that operates through its parts? I don’t suppose you or we will know this, ever, and so we for one, have given up, as we have said before. We just rejoice in the fact that “we are” and can explore our creativity. But you are still looking and so if you feel that everything is in the one place and you can understand that, then all the imagined realities of consciousness are in the one place also. Just as the pictures on your computer screen stack up, one behind the other, and as you click along the top headings they come to prominence, imagine that to infinity. All the pictures are there, on that flat screen, merely different configurations of the pixels. So imagine, as we have said before, that the quantum wave background, if you wish, we will make things up here as nobody can give you any better definition, just responds to any reality and can itself, each wave in the background, respond in infinite ways. Just as the block of stone holds all potential designs then the wave background holds all potential realities, so as you focus on the one you intend to see it simply appears around you and also if another says ”Come and join me here, this is a reality I have created. I am on a balcony of a coffee bar high in the hills of Capri with a fabulous view over the Mediterranean”, and they send you the thought form. You say “why not” and you sit in the seat opposite. We can say that you project a thought form through space or you can say that the reality is in the same place as every other reality. Within your imagination you join in the co-created imaginative reality of your friend and as you are both many consciousnesses acting as one, as we have said before, then the two of you, groups of consciousness, then enjoy a nice coffee and a chat overlooking the Mediterranean. But you haven’t gone anywhere, you have simply produced the reality that you enjoy and you have got lost in your own creation, lost in your drama only this time it is not a drama of course, and you enjoy the reality of it all and why should that not be? Now you can marry the two together of course. As you well know, time and space are relative and time and speed of motion are relative so if you come down to instantaneous, then no time has passed. So when your friend sends you the thought of the creation she has made in Capri, it comes instantaneously, you accept instantaneously and so time and space have simply disappeared. You are all in the one place, enjoying all your realities in no time and simply moving from one reality, one area of enjoyment, discovery, entertainment, thrill, challenge to another, whatever reality you care to join into we will say, rather than envisage, because all consciousnesses are grouping together to create the realities of their choice. You simply have to ask whether you can join in and if you are prepared to abide by the rules of that reality and you are acceptable to the majority that is within that reality then you can join in. It is simply sometimes, many times, getting to know that these realities exist. So you go from one to the other, you learn of others, you exchange notes, you exchange ideas and because the thoughts are continually moving around, too many to mention, in the main you will only pick up associated thoughts but sometimes they are so tenuously associated that they introduce you to new areas that branch off shall we say. Whereas you were thinking along one particular line you suddenly find yourself thinking along another particular line and according realities surface into your awareness. Have we been reasonably clear? Can you understand to some degree the notion of no time, no space, non-locality, everything simply being encompassed in one small point? Much like the Big Bang Theory of course. It all arose, sooooooooh it is speculated, from a singular little point. We have just demonstrated that not only can the universe arise from a single point but so can all realities. Can you see the comparison? Just over a year ago, a joint research study by a coalition of teams from four universities in Canada, Italy and the UK revealed the first observational and cosmological scale evidence to support the premise of our Universe being a cosmic hologram. 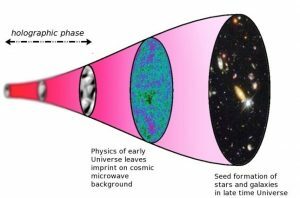 They did so by analysing irregularities in an energetic relic of the early Universe known as the cosmic microwave background (CMB) whose radiation was emitted around 380,000 years after our Universe came into being. Publishing their findings in the prestigious journal Physical Review Letters1 they were able to show significant evidence to support the view of our Universe being innately informed and holographically manifested. In their view as substantiated as the traditional hypothesis of cosmic inflation for the basis for these irregularities. The idea of a holographic Universe which was first proposed in the 1990s, posits that all the information that makes up our apparently 3D spatial reality is encoded on its 2D boundary with the information pixelated at the so-called Planck scale. A further paper in Physics Review Letters around the same time, by lead researcher Johannes Handsteiner of the Institute for Quantum Optics and Quantum Information in Vienna2 and his colleagues, used light from distant astronomical sources and entangled with laboratory photons to experimentally show the reality of nonlocal connectivity of our Universe to a distance of at least 600 light years and thus supporting the view that our Universe is fundamentally inter-connected. Coming around the same time as the publication of my book The Cosmic Hologram: In-formation at the Center of Creation3, these discoveries back up the numerous evidence across many fields and all scales of existence of our Universe existing and evolving as a unified entity; innately informed and holographically manifested. And such realisation does indeed, as Professor Skenderis hopes, point to how, for the first time, quantum and relativity theories can be reconciled by considering energy-matter and space-time as complementary expressions of information. Even more importantly, the increasingly compelling evidence is revealing that reality is informationally based, that mind and matter are essentially unified and that consciousness isn’t something we have, but fundamentally what we and the whole world are. Everything is consciousness expressing itself in different forms for the purposes of creativity and experience. My first comment after view the rather original structure of this website is that I find it so intriguing that I know I am going to visit it frequently and I hope to be able to exchange views and experiences with other users. I still have to get used to the flow of things here and as soon as I get the hang of it I shall do my part in in it. I am looking forward to some interesting contacts here. Best wishes!